The Faraday Me dal - one of the most conspicuous awards in modern physics - has found its heroes and landed in the terahertz (THz) domain in 2014! 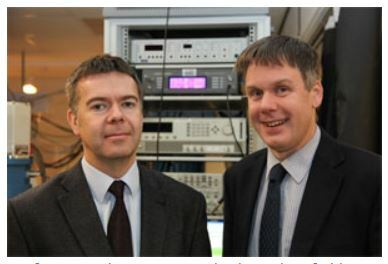 This year Edmund Linfield and Giles Davies, two professors from the Engineering Faculty of the School of Electronic and Electrical Engineering, the University of Leeds (the UK) won this annual international prize established by the Institute of Physics (IoP, London, UK). 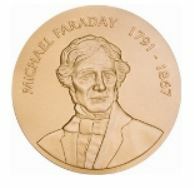 Previously known as the Guthrie Medal and Prize this medal has been in existence since 1914 being awarded for “outstanding contributions to experimental physics”. It took scientific R&D teams led by professors nearly 20 years of painstaking and consecutive efforts in terahertz technology research to reach this prestigious point of worldwide recognition. The use of terahertz and sub-terahertz rays of electromagnetic spectrum has always been extremely challenging and promising for science, because this type of electromagnetic radiation is absolutely safe, non-destructive and much more informative due to quite active and specific absorption by various substances, cells and tissues. In fact lying ‘at the interface between electronics and optics’, as worded in IoP press release, terahertz rays (or T-rays) are non-ionizing and can penetrate many opaque materials. These unique qualities make Terahertz potentially much more interesting and informative than X-rays and near infrared radiation (NIR) expanding their possible applications to such spheres as homeland security (full body scanning); chemical analysis, quality control (non-destructive testing); medical imaging and many others. The contributions in Terahertz science made by professors Davies and Linfield that largely underpinned international exploration and incipient exploitation of this part of the electromagnetic spectrum were related to development and creation of a ‘solid-state device based on a sophisticated layered semiconductor superlattice structure’, which is now commonly known as THz frequency quantum cascade laser. Their achievements in this area were also highly instrumental in development of the entirely new field known as terahertz photonics and have furnished truly priceless insights for other research groups involved in terahertz pulse amplifier demonstration and coherent optical sampling dealing with seeded terahertz field. Moreover, one can hardly overestimate the significance of the input made by their research teams into the development of terahertz spectroscopy systems for characterizing materials and terahertz imaging devices, which virtually capacitated ‘sensing another vision’ and helped Terasnse ‘look into the matter of things’, in line with our corporate goal statement. There is no doubt that their breakthroughs secured a leading position for Leeds University in the sphere of terahertz technologies for at least the last two decades. All Terasense team members, who - to some extent - also capitalize on these achievements, cannot help but extend their most heartfelt congratulations to Prof. Alexander Giles Davies and Prof. Edmund Linfield, wishing them everlasting inspiration that should move them closer to their next discoveries!